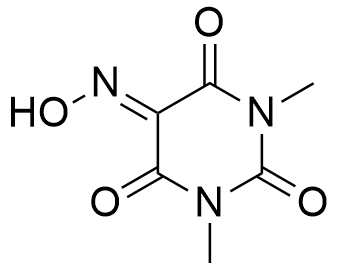 Oxyma-B is an oxime derived from 1,3-dimethylbarbituric acid, with a special orientation of the carbonyl moiety, is one of the best oxime additives currently available for racemization-free peptide synthesis. Its ability to preserve chiral purity in peptide coupling reactions exceeds that of both OxymaPure® and HOAt. Oxyma-B can play an assisted basic catalytic role by enhancing the nucleophilicity of the amino function during coupling. In addition, Oxyma-B does not show any ester moiety in its structure and therefore, there is no risk of any side-reaction. 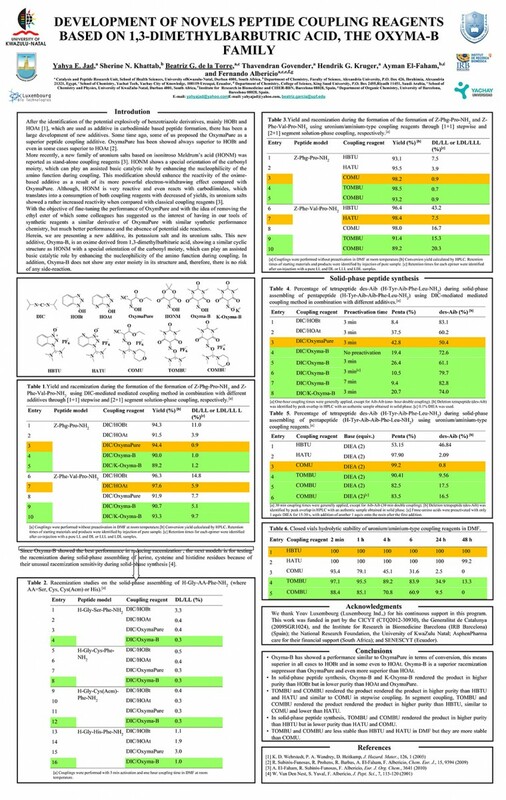 Oxyma-B is soluble in a wide range of solvents, including green solvents such 2-methyltetrahydrofuran (2-MeTHF) and cyclopentyl methyl ether (CPME). 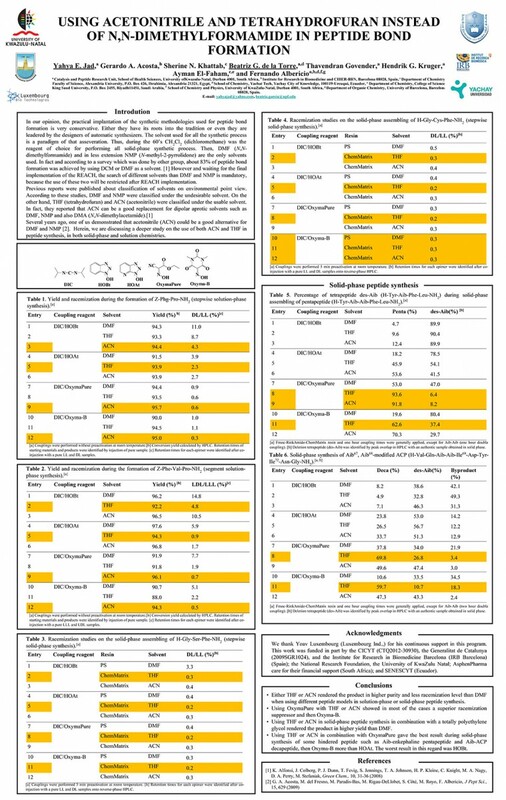 The additive Oxyma-B can be used in the presence of carbodiimides and has been shown to be effective in the synthesis of difficult peptide sequences, with yields comparable syntheses performed with OxymaPure®. solution. The solution is blue at the start of the reaction and after completion becomes a yellowish green. Oxyma-B does not contain any ethyl ester, which could lead to side-reactions. Oxyma-B presents satisfactory performance in assembling demanding sequences such as the Aib-enkephalin pentapeptide (H-Tyr-Aib-Aib-Phe-Leu-NH2). Oxyma-B showed better results than OxymaPure when used as a racemization suppressor and exceeded those achieved with HOAt in both stepwise and segment coupling in solid- and solution-phase peptide synthesis. Y. E. Jad, S. N. Khattab, B.G. de la Torre,T. Govender, H. G. Kruger, A. El-Fahamb, and F. Albericio Org. Biomol. Chem. 2014, 12, 8379–8385. Y. E. Jad, G. A. Acosta, S. N. Khattab, B. G. de la Torre, T. Govender, H. G. Kruger, A. El-Faham and F. Albericio, Org. Biomol. Chem., 2015,13, 2393-2398.